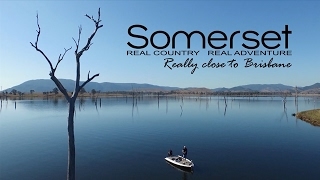 Lake Somerset is just south of Kilcoy and is a very popular boating and recreational spot. Motorised and non-motorised watercraft are allowed on Lake Somerset along with waterskiing, jet skiing, and wakeboarding. Boat ramps are available at three locations across the lake and can be found at The Spit, Kirkleagh and Westvale road. The lake is also a great fishing spot either from your boat or along the shoreline. Don't forget to grab your boating and fishing permits before heading out or dropping a line. If you would rather be in the water than on it, take a dip at the designated swimming areas at The Spit and Kirkleagh. These areas also provide picnic and barbecue facilities, along with Somerset Park, so make the most of if and enjoy the whole day by the water. If you want to stay longer there are a number of private campgrounds, holiday houses and retreats close by. Find out more about the accommodation around Lake Somerset at the Kilcoy Information Centre.